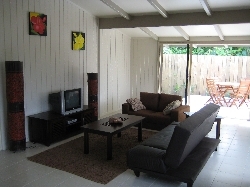 Welcome to our selection of holiday homes to rent in Vanuatu. Vanuatu is an island nation in the South Pacific. It takes the form of an archipelago situated about 1,000 miles east of Australia. The Melanesian people were the earliest settlers and still comprise the vast majority of the population. The climate is sub-tropical with temperatures ranging from 20 to 32 degrees C depending on the time of year. April to September mark the cool season while December to April mark the rainy season. The landscape is largely forested with a few interesting native species such as the flowerpot snake, banded iguana and a wide variety of bats. 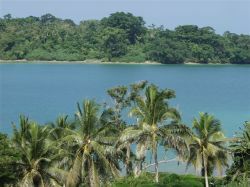 There is a tremendous range of activities to be pursued in Vanuatu. Water activities include fishing charters, seaplane tours, watersports, snorkeling and many others. The range of marine wildlife is much more varied than that inland, including creatures such as whales, manatees and sea turtles, which are supposedly very tame. There are also interesting underwater features to be explored such as reefs, caves and shipwrecks. Further inland activities include helicopter tours, abseiling tours, nature tours and river excursions. The most exciting tour may well be the active volcano Mount Yasur, which can be safely viewed from a distance even during eruption. Vanuatu has more than its share of annual events and festivals. The Melanesian festivals include; The Land Diving Festival, which is a simple prototype of bungee jumping, The Ambrym Magic Festival, The Ruan Cultural Festival and The Back To My Roots Festival. Looking for self catering holiday accommodation in Vanuatu? then below is a selection of villas in Vanuatu and apartments in Vanuatu that can be rented direct from their owners. You can either click on each listing for further details or you can use our search engine on the left if you are looking for something in particular.